Lealon Morris Vassar, 74, of Charlotte Court House passed away peacefully November 22, 2017. He was born June 25, 1943, in Norfolk, Virginia. Lealon was preceded in death by his parents Lealon Godfrey and Elizabeth Ruth Zabriskie Vassar. He is survived by his wife of 54 years, Brenda Nichols Vassar, son Lealon Gregory Vassar (Cheryl) of Charlotte Court House, daughters Shannon Vassar Feinman (Steve) of Charlotte Court House, and Karen Vassar Goodman (Jason) of Stafford, grandchildren Lealon Matthew Vassar, Cameron Leighton Vassar, Meredith Vassar Feinman, Cole Joseph Feinman, Keaton Elizabeth Goodman, Wilder Matthew Goodman, Carys Vassar Goodman, and sister Faith Vassar Shore (Forrest) of Randalman, NC. Lealon was a treasured husband, father, grandfather, and dedicated family man to his large family and to many others in the community who thought of him as a father, grandfather, or advisor. 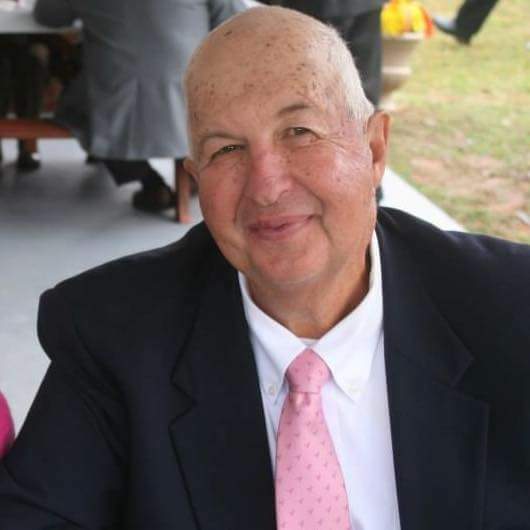 He loved supporting youth activities, especially athletics, and enjoyed coaching his beloved Dixie Youth Charlotte Court House Red Midgets and Minors. He was devoted to New Hope United Methodist Church serving over the years as Chairman of the Board of Trustees, Sunday School Superintendent, and Administrative Council Chair. He found great joy as a charter member and President of Knock Down Hunt Club since 1972 relishing the fellowship and the outdoors. He had a generous heart, and was dedicated to the Truckers Parade Against Cancer and American Cancer Society among other charitable organizations. The third of five generations in the logging business, he was the owner of R&V Mill, R&V Trucking and Pulpwood and Logging, Inc. The family will receive friends at Browning-Duffer Funeral Home in Keysville on Saturday, November 25, 2017, from 6:00-8:00 pm. Funeral Services will be held at New Hope United Methodist Church on Sunday, November 26, 2017, at 2:00 pm., with interment to follow in the church cemetery. Donations may be made to New Hope United Methodist Church Building Fund or the Truckers Parade Against Cancer. The Browning-Duffer Funeral Home in Keysville, VA, is serving the family. Lealon , Had a Great Big Heart , and will be deeply missed by his Family and all of his friends . It wasn’t anything that Lealon wouldn’t do for his community or his family. He will be greatly missed by the Truckers Parade Against Cancer Family and Team . Our deepest sympathy goes out to the Brenda , Greg , Shannon, Karen and all of His Family. Lealon will be missed in the community. He was a blessing to all who knew him. The DiLullo family is very sorry to learn of Lealon’s passing. We would like to extend our deepest condolences to the entire Vassar family. It is a great loss to our community and he will be missed by a great number of people whom he touched. Our thoughts and prayers go out to the family and friends of Lealon. Brenda, so sorry to read of Lealon’s death. What a joy it was to renew our friendship with your entire family in our 2 years living in Charlotte Court House. May God be your strength and guidance in the days ahead. to Brenda, his children, his extended family and his community. I am truly sorry to hear of the passing of Lealon. Know that your entire family is in my thoughts and prayers. Your loved one has transitioned from earth to glory, oh what join it must bring to know that He is at peace with his Heavenly Father. I pray your strength and comfort in the Lord. We are truly sadden to hear of the passing of Lealon. He was a good friend to my late husband, Robert Davis, Sr and to all who knew him. Our sincere condolences to the Vassar family. Please know that your family is in my thoughts and prayers during this difficult time. Lealon was a wonderful person and he will be greatly missed by do many and fondly remembered for his many generous and unselfish acts of kindness.